If you are hosting Thanksgiving this year, your focus is probably on the bird—not the dog. 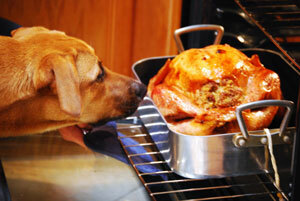 But to ensure a happy and stress-free day for both you and your pet, plan ahead for safety on Thanksgiving Day. What to serve, and to whom? While some think that sharing the Thanksgiving food bounty with your dog is fine, most experts would recommend reserving the feast for human guests. If you do opt to offer people food to your dog, plain turkey (100% bone-free), mashed or sweet potatoes, raw carrots, and apples are probably the safest foods to share. Absolutely avoid turkey skin, seasoned food, mushrooms, onions, and garlic, alcohol, chocolate, and spices. A KONG toy is a fantastic way to give your dog a long-lasting treat. Try stuffing it with this Thanksgiving recipe! Unless all of your holiday guests spend time with your dog regularly, consider exercising and feeding your dog ahead of their arrival. Your dog will be prepared for a long nap, and you will be free to socialize and serve the traditional meal. Consider providing your pet with a safe, quiet space away from the commotion. That space should contain a bed, water, calming music, and a treat-filled toy. Only those who feed the dog daily should feed the dog on Thanksgiving. No treats slipped to your pet from an indulgent adult; no nasty vegetables shared by enterprising youngsters. Children and pets should maintain their distance. Both species are likely to be overly excited on Thanksgiving Day! Doors should be monitored and kept closed to guard against dogs that tend to wander or escape, or dogs that may be particularly skittish on the holiday. We hope that you have many reasons to be thankful this year. Having a dog is certainly one good reason! All of us at Karen Pryor Clicker Training wish you, your families, and your pets a happy Thanksgiving Day! Enjoy food, family, and time to appreciate the joys in your life.